We have been roleplaying Space Opera for over thirty-five years, ever since the release of Star Wars and the publication of GDW’s Traveller. In that time the genre has either gone high and fantastic, arguably right out of the Science Fiction genre all together, typified by the four Star Wars RPGs; enlisted in the semi-military, as typified by the five Star Trek RPGs; or let the player characters go independent with their own ship, as typified by the archetypal Traveller campaign and more recently by the Firefly Role-Playing Game: Gaming in the 'Verse, published by Margaret Weis Productions. What Ashen Stars does is set course between the semi-military and the independent ship operator and make every trip into an investigation. Ashen Stars is the investigation-orientated Gumshoe System RPG written by the Gumshoe System’s author, Robin D. Laws, and published by Pelgrane Press. It works from the idea that the idea that Space Opera stories, especially those screened on television, are essentially mysteries to be solved. ‘The Devil in the Dark’, an episode of Star Trek from 1967 is a classic example of a Space Opera investigation in which the crew of the USS Enterprise must find out who is killing the workers and destroying their machinery on a mining planet. Further, the episode and others like it, give a chance for each of the series’ stars to shine. It is this model that Ashen Stars adopts before going on to build a unique setting all its very own. In the wake of the Mohilar War, both the interstellar economy and government have collapsed and whilst The Combine exists, its reach has been pulled back from the Bleed. Thus the worlds the Bleed, many scorched and blasted by war, have been left to their own devices, bound only by a common currency and cultural ties. Where Combine patrols once kept the peace, peacekeeping missions and criminal investigations are now put out to private tender and assigned to independent ship operators known as ‘Licensed Autonomous Zone Effectuators’ or ‘Lasers’. As Lasers, the player characters will crew and operate a ship on a tight budget, hoping to pick up assignments that if completed will enhance their reputation and so lead to better and more profitable assignments. Each crewmember will undertake a role aboard ship and off ship for efficiency’s sake. Although most Lasers are Human, a typical player character crew will consist of several members of ‘The Seven Peoples’ of The Combine. The seven include the uncannily beautiful Balla who love nature, but fear all emotions; the Cybes, former humans whose bodies and minds have been radically altered through cybernetic and genetic science; and the Durugh, short alien humanoids that can phase through solid matter who were once the enemy of The Combine. The Kch-thk are a warrior locust-like race that used to have a reputation for eating other species and can transfer to new bodies when their old ones die; the armadillo-like Tavak are placid warriors with strong ethics who fear falling into a battle rage; and the Vas Mal are a new Grey-like species given physical form following the Mohilar War from their former existence as near-omniscient energy beings. Lastly, Humans, as expected of the genre, are adaptable, resourceful, and numerous. Each Laser undertakes two roles as part of a crew. One is Warpside, that is, aboard ship; the other is Groundside, that is, off ship. The former are Communications Officer, Pilot, Strategic Coordina¬tor, Systems Officer (engineer), and Weapons Officer, whilst the latter are Cultural, Operations, Survey, Security, and Technical. The Medic occupation is a mixed role that is important to both Warpside and Groundside, and rarely doubles up with another role. In selecting one from each category a player creates a character that has a role to fulfil or something to do when aboard ship or when conducting investigations off ship, and this is one of several balancing mechanics established in the game. Another is the number of points that each player receives to assign to his character’s Abilities. A player receives two pools of points, the smaller one to assign to his Laser’s Investigative Abilities, which are used to gather clues; the larger number to his General Abilities, which represent his physical skills. A player has to assign points to certain Abilities as these represent his Warpside and Groundside roles, plus if he is playing an alien species, then there a number of special Abilities that he has access to. For example, the Vas Mal are capable of Consciousness Simulation which enables them to interrogate the recently dead through their brain wave traces, whilst the Durugh can Phase and pass through objects. Rounding each Laser is his Drive – what motivates him to serve, like Bleedism (the Laser believes that the Bleed should be independent of The Combine) or the Hunger Tourism of the Kch-Thk (the Laser likes to go places and eat new foods). Together as group, the player Lasers select a ship, of which there are ten Classes to choose from, including the balanced Runner, the offense heavy Hammer, and the Sherlock, which bristles with sensors and laboratories. Whilst this ship is free, the Lasers must pay for any extra gear beyond their standard equipment as well as any personal cybernetic and viroware enhancements. An array of both is available for purchase, some of which the various races of the Combine have an affinity for, while others are incompatible. All cyberware and viroware are incompatible to the Vas Mal. The Lasers will have a budget for this, out of which they must also pay for any ship bolt-ons like cargo modules or a Peacefist which enhances attempts to disable the weapons of enemy vessels. In addition, each player needs to decide what his Laser did in the Mohilar War, and then as part of the Laser team, decide how they came to possess their ship. Every character also has a personal development arc, such as identify the Mohilar or return to my home dimension – this latter particular to the Vas Mal. Each arc represents a story that a player wants to explore and see developed through the B-Story presented in each episode or scenario. Our sample character was a scout for The Combine Colonial Administration surveying new worlds for on-going colonial expansion into the Bleed. He was caught behind enemy lines at the outbreak of the Mohilar War and was injured during the initial attacks. He would have died from his injuries had not a Cybe enclave rescued him and ‘upgraded’ him to help him survive, though his injuries left him with memory loss about his time before the war. He fought in a guerrilla war against the invaders until the Mohilar disappeared. He signed on as a Laser to find out who he was and to further the Cybe cause. His Cyberware and Viroware were installed to improve his survival chances and holding extra data. Personal Arc: Discover where my family is. 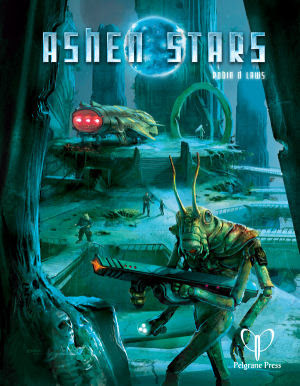 Mechanically, Ashen Stars uses the Gumshoe System and therefore deviates little from the previous titles that Pelgrane Press has published – Trail of Cthulhu, Esoterrorists, Mutant City Blues, and so on, and has used since in Night’s Black Agents. The Gumshoe System has the ratings in Investigative Abilities being spent to gain extra clues during the course of an adventure or investigation – if a Laser has a rating in any one Investigative Ability, then he can always gain the base clues related to that Ability, whereas the ratings from General Abilities are spent to modify dice rolls. Beyond the investigative nature of the rules that is particular to the Gumshoe System, what Ashen Stars brings to the game are rules for running a Space Opera style game, most obviously those for spaceships, space travel, and space combat. The rules for the latter initially appear to be quite complex in comparison with the rest of the rules in the book, and it takes the full example of space combat given in the book’s second appendix – the first consists of a list of sample names for each of the seven races in The Combine – for the reader to grasp how they work. They are designed to handle a more cinematic style of spaceship combat rather than a realistic one, though a no less gruelling one. The background to Ashen Stars – The Combine and the Bleed and how they interact; the major cultures of the Bleed; and a history of The Combine are given in detail. Also presented is a more detailed discussion of how Lasers go about obtaining and fulfilling contracts as well as how the Lasers can go about making extra money beyond their contract. In particular this focuses Reputation as a mechanic, this being both the standing by which the player group of Lasers is held and the modifier that will affect how often they will be assigned contracts and how good they are. It also lies at the heart of the game theme, that of the balance between altruism and self-interest. Building a positive Reputation primarily means often having to go beyond the exact terms of a contract – for example, in the aforementioned episode of Star Trek, ‘Devil in the Dark’, Kirk, Spock, and McCoy discover who has been killing the miners and destroying their machinery, but make first contact with the culprit and come to an accord with it. In addition, it often means presenting a positive spin upon the events of the investigation and their outcome, which is why the Public Relations General Ability is of importance to Laser teams. For the GM there is an array of particularly nasty semi-sentient and sentient alien threats to throw at the Lasers, as well as good advice on running a game. This being a Space Opera game, then the advice is build investigations not around problems, but around worlds as these will be unique from episode to the next, and then of course around cases, as after all, Ashen Stars is an investigative game. Both aspects readily lend themselves to the episodic nature of genre television that the RPG is based up, and it should be pointed out that the genre television that inspires Ashen Stars is the more modern and grittier take upon the genre – often seen in reboots. Rounding Ashen Stars is an introductory scenario, ‘The Witness of My Worth’, in which the Lasers are contracted to respond to a distress call to a survey team stationed on planet severely damaged in the war. It does a good job of introducing the rules and the setting whilst also pleasingly putting a twist or two upon various Space Opera staples. Physically, Ashen Stars is a well laid and fine looking book, all done in full colour. If there is an issue, it is that the book is in places slightly intimidating to read, this down to the use of a sans serif font. Further, the use in places of a serif font – which is more legible – actually clashes with the look of the book. Where the earlier Trail of Cthulhu allowed the GM to set the campaign styles to either Purist or Pulp and the more recent Night’s Black Agents let the GM set the mode of his campaign – Burn, Dust, Mirror, or (High) Stakes Mode – to determine the tone of its espionage and the nature of its vampiric threat, Ashen Stars does not allow such options. In fact, in comparison with other Gumshoe System RPGs, Ashen Stars is fundamentally straightforward and unfussy. Were it not for what the RPG does to the genre it is emulating, that is rework it as an investigation game, Ashen Stars would be considered to be a very traditional RPG. Instead it highlights and makes its focus upon the usually ignored investigative nature of the genre, the feature of Ashen Stars and so refreshes the genre.